Originally laid out by Herbert Strong, the Old course has since been renovated by Perry Maxwell and, more recently, Tom Fazio. It’s one of three 18-hole layouts at Saucon Valley, where the club has hosted a number of national competitions down the years including the US Amateur in 1951, a couple of US Senior Opens and the US Women’s Open in 2009. A round on the Old ends with three very strong holes: water threatens the left side of the green at the long par four 16th, a creek crosses the fairway of the 422-yard 17th whilst the uphill 18th hole plays to a difficult, sand-protected putting surface on the home green. I have been blessed to play the Old Course at Saucon Valley Country Club a number of times. It always leaves me with a satisfied feeling that I played a truly ‘championship’ caliber course. While architecturally speaking it does not bowl you over with options or angles, but it does place a premium on accuracy and tests your focus. Lose focus here and you will add a lot of strokes to your score.The front nine is the heavy hitter here…. Especially from the back tees. Demanding par 4s at holes 2, 5, 7, & 8 are all well over 400 yards. If you miss any of these fairways you will be scraping away just to make bogey. The opening first hole (a downhill par five) is your best chance for birdie on this side. From the member tees it actually presents a decent eagle opportunity for the longer hitter since the green is open in the front. The front finishes with a very difficult par 3 that requires a long carry (from the back tee) to a green set on the opposite side of Saucon Creek. Think of the 4th at Baltusrol with a wide creek instead of a pond and you have the 9th on the Old Course.The back nine offers far more interest from a design perspective. When Herbert Strong laid out this side he definitely had more interesting land forms and options to utilize. While the holes are overall not as long and demanding as the front nine, there is still plenty of brute strength in these holes. The 12th, 16th and 17th are similar in scale to the monster par 4s you faced on the front side. But, scoring opportunities for precise play are available at the short par fours (which I think are each great holes). Hole 10 plays downhill and is a straightforward parkland hole with flashed bunkers guarding the fairway and green. The 13th is a slight dogleg right at 336 from the tips and offers a risk reward scenario to driving close to the green. The fairway bottlenecks and the bunkers become more numerous as you get closer to this tiny target. The 18th is real treat in my opinion. First you must cross the Saucon Creek (loaded with fish by the way) and then you must hit a short iron up a steep embankment to a shallow heavy sloping green. On one occasion, I played this par 4 right after the US Senior Open when the greens were running at about 13 on the stimp and the grandstands were still up. It was amazing to experience a small sliver of the thrill that championship golfers face each week. In my humble opinion, I feel that this finisher is one of the most underrated short par 4s in golf. With the clubhouse backing the green and the fun shot making that is required, it is a joy to play this hole …. Not to mention it makes you want to cycle back around to the first tee. 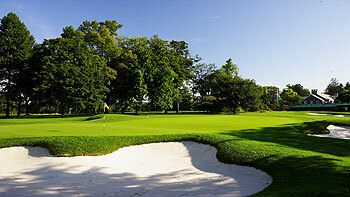 Overall, I will say that the Old Course at Saucon Valley is a fantastic ‘old style’ championship course. Is it my favorite at the club? No. That award goes to the Weyhill since it is (in my mind) the most enjoyable/fun/interesting experience. But that in no way diminishes my love and respect for the Old. When I feel the need to really test my game on a stern test, I head over to the Old. A classic Herbert Strong 1921 parkland layout across rolling terrain that plays host to the 2014 Mid-Amateur championship. From the back tees, the front nine is 3700 yards, inclusive of par 4s measuring 474 yards, 480 yards, 465 yards and 430 yards. Add in the two actual par 5s on the front side and you walk off the 9th saying “I’ve never played so many par 5s in 9 holes before!”. The bunker complexes are well positioned in the landing areas, and certainly pinch tight enough to catch wayward drives. It’s a very demanding opening nine holes and truly worthy of a USGA event. The back nine is much more manageable on paper, however, the changes in elevation and constant dog-legs challenge accuracy and finesse over length. One of the many beautiful holes is the par 4 13th. Fronting the old Georgian clubhouse, it is a relatively short hole that demands accuracy due to a series of six bunkers positioned down the left side of the fairway and four perfectly placed on the right. A drive to a narrow landing area leaves a short iron approach to a well-guarded, undulating green. A legendary story from this course occurred during the practice rounds of the US Amateur in 1951. Players were asked what they thought of the course, and a number of players mentioned that the course was fabulous except for the weak 13th hole, which was wide open and allowed players to bomb their drives at the unprotected green. Mr. Grace, the iconic Chairman of the club, was also the Chairman of Bethlehem Steel at the time. Upon hearing these complaints about his course, the God-Like leader brought all of his workers from the steel factory over the country club and demanded that they insert 6 bunkers up the left side of the 13th hole overnight and must have the work done before the sun comes back up the next day. When the competitors arrived back for the next round of play in the tournament, they were flabbergasted to see the string of bunkers on the 13th hole. Comments made like that to Mr. Grace didn’t go unnoticed. Just when you thought all the long holes were over with, welcome to the 615 yards 15th followed by the merciless 496 yard par 4 16th hole! There’s at least 5 par 4s from the back tees on this course that feel like par 5s, and having played the course on a calm day, I can only imagine how it feels from the tips even with a 15mph breeze. Water comes into play on 16, 17 and the relatively short 18 hole. The Old course at Saucon Valley is a stark contrast to Weyhill and Grace courses, as it’s elegantly simple in design. It has undergone a number of renovations over the years, not only by the original architect, but also by William Gordon and, later, Perry Maxwell. With each renovation, the emphasis has been on preserving the integrity of the original design, while improving various holes.